President Lyndon Johnson signs the Civil Rights Act on July 2, 1964. 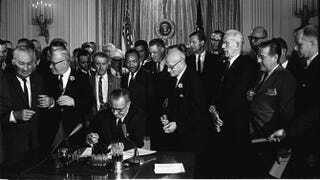 Fifty years ago today, President Lyndon Johnson signed the Civil Rights Act into law. The comprehensive, landmark legislation outlawed, among many other things, racial segregation in public accommodations. Jim Crow, in both its more overt Southern and subtler Northern manifestations, was officially proscribed, although racial apartheid would continue in American schools, neighborhoods and the workplace until this day. Undoubtedly, Johnson and Congress deserve credit for passing this legislation, a feat made all the more remarkable when judged alongside Washington’s current political dysfunction. But the Civil Rights Act would not have been enacted without a grassroots movement that placed extraordinary pressure on politicians and civic institutions. Civil rights legislation represented the culmination of thousands of strategic marches, demonstrations and protests aimed squarely toward advancing the cause of racial and economic justice. The year 1964 stands out as one of history’s turning points, a year in which young activists faced racial terror in Mississippi, Martin Luther King Jr. braved racial violence in St. Augustine, Fla., America’s oldest city, and sharecropper turned political organizer Fannie Lou Hamer choked back tears while offering the most elegantly defiant racial testimony at the Democratic National Convention in Atlantic City, N.J.
It’s worth remembering America’s initial response to civil rights activism. Thousands of nonviolent demonstrators faced arrest, beatings and, at times, death, while hundreds of black churches were bombed and many working-class folks were kicked out of their homes for simply daring to challenge the nation’s racial status quo. Even after the Civil Rights Act was passed, many would have to put their lives on the line to see that the law would be enforced. A half-century later, women and all people of color have reaped important benefits from this legislation. Combined with the Voting Rights Act, fair housing laws and affirmative action, African Americans gained unprecedented, although still unequal, access to politics, corporate America, higher education, sports, entertainment, media and culture. The Civil Rights Act helped to fundamentally transform American democracy, ushering in the rise of black mayors in major American cities, the Congressional Black Caucus and, in 2008, the election of the nation’s first black president. Yet if we are to judge progress by the social, political and economic health of the black community, not only is the glass half-empty but it’s losing water fast. When it comes to race and public policy in America, the devil is in the details. Assaults on affirmative action, lax enforcement of civil rights and anti-discrimination laws by federal and state governments and the white public’s general fatigue over race matters has created a perfect storm of political retrenchment. By the 1980s, a mere two decades after the CRA’s passing, a drug war primarily targeting poor black folks aggressively undermined the spirit and legacy of the civil rights movement, and the subsequent mass incarceration of young black men and women dovetailed into the deteriorating condition of urban America’s public schools and neighborhoods. The most pressing question for the black community on today’s anniversary is where do we see ourselves 50 years from now? The answer requires an honest and sobering assessment of the victories and shortcomings of the past half-century. The dazzling, undreamed of achievements by the likes of Barack Obama, Oprah Winfrey, Admiral Michelle Howard or John W. Thompson are rightfully celebrated in black America as examples of hard-earned progress. Yet even today these success stories are, when we examine the empirical evidence, outliers in a more fragmented landscape that points to the decline of the very ideal of racial and economic justice in our lifetime. That the nation can celebrate this anniversary—like last year’s March on Washington celebration and the inevitable remembrances of Selma, Ala., and the Voting Rights Act next year—during the tenure of the first black president, is more than just a hopeful sign of racial progress. It’s a sobering reminder of America’s racial duality (or, perhaps, schizophrenia) and one of the Civil Rights Act’s unanticipated legacies. The struggle for racial justice taught America many important lessons. One was the power of narrative in shaping our national identity. We now live in an era where a black man can preside as head of state. Yet this victory is tarnished by the stubborn reality that allows the nation to simultaneously celebrate parts of the civil rights saga even as it takes steps to ensure that the opportunities that produced a President Obama might never be offered again. Peniel E. Joseph, a contributing editor at The Root, is founding director of the Center for the Study of Race and Democracy and a professor of history at Tufts University. He is also the Caperton fellow for the W.E.B. Du Bois Research Institute at Harvard University. He is the author of Waiting ’Til the Midnight Hour: A Narrative History of Black Power in America, Dark Days, Bright Nights: From Black Power to Barack Obama and the recently released Stokely: A Life. Follow him on Twitter. Peniel E. Joseph, a contributing editor at The Root, is professor and founding director, the Center for the Study of Race and Democracy, the Lyndon B. Johnson School of Public Affairs at the University of Texas at Austin. He is the author of Waiting ’Til the Midnight Hour: A Narrative History of Black Power in America, Dark Days, Bright Nights: From Black Power to Barack Obama and Stokely: A Life. Follow him on Twitter.